Buy 1 for $21.67Buy 2 / Save $1.16!Buy 3 / Save $4.33! Chondroitin is naturally found in our cartilage, tendons, and ligaments where it binds to proteins like collagen and elastin. It is partially responsible for the strength, flexibility, and shock absorption in our joints. It provides both structure and lubrication (through water retention) within our joints. It is for these reasons that chondroitin has become a popular dietary supplement used in the treatment of osteoarthritis. Some studies indicate that chondroitin is as effective as aspirin and other NSAIDs (nonsteroidal anti-inflammatory drugs) at relieving arthritic pain; additionally, it has the added advantage of being side-effect free unlike its chemically based counterparts. Chondroitin is well-absorbed by the body and has demonstrated positive results in osteoarthritis sufferers. Many researchers agree that chondroitin taken in combination with glucosamine sulfate or glucosamine hydrochloride is more beneficial and studies seem to back up this assertion. "Supplements such as glucosamine sulfate and chondroitin sulfate may actually help restore damaged tissue structure in joints, perhaps because these two substances are natural constituents of healthy cartilage." Glucosamine is a naturally ocurring protein sugar found in the body. It stimulates the formation and repair of cartilage. Due to the fact that natural levels of glucosamine decline with age, many people benefit from supplementation of synthetically formulated glucosamine products often derived from sea creatures. Clinical studies are numerous and results clearly show that slow and steady intake of glucosamine (often in combination with other substances such as chondroitin and MSM), particularly for conditions such as osteoarthritis, can halt the progression of degenerative joint disorders, and may, in some cases, even reverse the diseases. 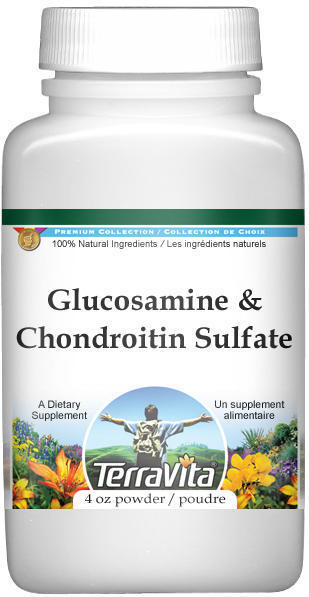 "Taking Glucosamine Without Chondroitin? You Fool You!." "Topical Glucosamine / Chondroitin Cream Relieves Knee Pain." "Glucosamine Shown To Have No Effect On Blood Sugar." "Glucosamine Hydrochloride VS. Glucosamine Sulfate." "New Glucosamine Studies In Europe." "Supplement May Help Bring Arthritis Relief." "Which Glucosamine Is Best For Painful Joints?."